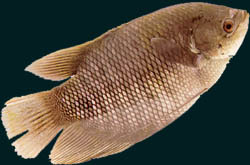 Specimens with a total length of 1.5 cm and body weight of 1.0 kg are common though smaller fish are found in plentiful supply. Air-breather. Being a herbivore the diet consists of soft vegetation, insects and worms. Dominant in the rivers than in the lake. Accepted by most people. Market price ranges from RM4.00 - RM5.00. Potential for aquaculture especially in ponds and cages, as well as in the aquarium industry.